"WAIT! Before you go on, ask yourselves this... Will your relationship suddenly become boring- like when L'il Abner married Daisy Mae or when Jeanie married Major Nelson?" Monty's girlfriend responds, "How about Lucy and Ricky?" Robotman adds, "Yeah, but remember when they had Little Ricky and moved to Connecticut?" But I think that we need to take this for what it is. Something to get the general public that hasn't been following this series since its inception and announcement months ago. We knew Kermit and Piggy were split up way before this. If this gets people talking and that talk translates into ratings, then I see no issue with this. And really, like...haven't Kermit and Piggy been split up and reunited like 2 or three times since the 90's? Duke Remington, jvcarroll and LeanneRivett like this. We knew Kermit and Piggy were split up way before this. If this gets people talking and that talk translates into ratings, then I see no issue with this. It would be interesting to see if this makes casual fans indignant enough to watch the show and see how it turns out. Yeah who is this "we"? Not me! Honestly, I know they are fictional characters but so are most any character we like on any TV show or movie. Actors portray characters in a believable way so that people can't help but like them and associate them with the character. If you allow yourself to be entertained by the actors, let your imagination take over, then yes, the illusion they portray is real. Ok enough babbling... I think you get my point. They are real to me and Kermit & Piggy have true love forever! LeanneRivett and CensoredAlso like this. Well if anything good has come of this at least it has brought Beth back to the forums! Welcome back! I agree with everything you have said on this matter with the exception of not giving the show a chance. Thank you, glad to be back. Ok I'll give the show a chance. I'm a Muppet lover, so you know I'm going to watch regardless. I may not agree with the format but it is all our lovable Muppets together again. LeanneRivett, MUPPETFAN1976 and dwayne1115 like this. My friend finally got me to watch the trailer thing. I'm honestly still going back and forth. Every now and then it was genuinely funny for me. And every now and then I shook my head in utter disagreement, lol. I just don't know. Btw, love your signature, that was a pleasant flashback this morning! Now, they had this same thing in 1990 with " The Pig of The Nineties", but Jim Henson died that same year and that was tossed. Duke Remington and LeanneRivett like this. Their break-up is the #1 trending topic on Facebook right now. Whether you like it or not, people are talking about the Muppets and their new show. The ends justify the means. Duke Remington, charlietheowl, WalterLinz and 2 others like this. I keep going back and forth too. I'm not crazy about reality shows in general - in fact I avoid them like the plague. What is really funny - is I hear this new pig Kermit is "dating" is named Denise. When I got my mini-van last year, we ended up naming my van Denise. (there is a funny story behind that too, but I digress). Now when I hear Kermit and Denise I have this mental picture of Kermit chasing my minivan. Where is Charles Grodin when you need him? You know I heard a fairly recent podcast interview with him, and Nicky's still pining over Piggy, lol. Right now, I'm taking this with a grain of salt, they've been on-again, off-again for years. (Rachel and Ross, anyone?) if the news translates to the new show, we'll see where this goes. Although, I really wish that the tabloids would leave the Muppet universe alone for once. Duke Remington, LeanneRivett, CensoredAlso and 1 other person like this. 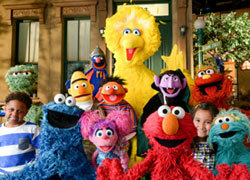 people are talking about the Muppets and their new show. The ends justify the means. Sure, the marketing people did their job and earned their salary. Now it's the show's turn to prove itself. Sigh... if only they pulled something like this for MMW and not just get them to go on QVC. Then it probably wouldn't have been spanked at the box office by a mediocre cliche storm based on a factory made YA novel. We all want this show to do well. Even if some don't like the end result, keeping the characters back in the public eye translates to more T-shirts, Pop vynals, plush toys, and maybe DVD releases (or at the very least, more Netflix releases). To me, as long as they don't become a Terrible, gimmicky rock band with like, one good song amongst a field of misfires, a Super Hero team based on the fact some out of touch 50 year old board room member saw a kid holding a DBZ figure somewhere, or what they did to George of the Jungle, I'm fine with it. I can guarantee that Disney will still market materials of Kermit and Piggy as a couple in products etc. The point is that they don't have the same sort of relationship as Mickey and Minnie. They've always had a hysterically contentious romance (that was mostly one-sided on the Muppet Show). I keep reading all of these silly comments on YouTube and across the web where casual fans are freaking out about everything from alcohol references to sexual tension. The Muppets have always had this! A lot of their humor was pasteurized after Jim died and I guess a lot of fans grew up with these safer post-Jim Muppets, but I'm glad they're going back to their roots and moving forward from there. I don't want the Muppets to be safe. I don't want them trying to hard to be "hip" either. And I think what we've seen so far has handled everything pretty well. As for the "what if" pessimism, I won't engage in that. There are some people who will always find something to be upset about or to pick apart (that will probably never happen anyway). 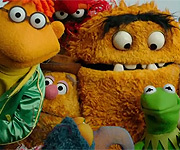 Many fans measure the Muppets in a "what would Jim do" sort of mindset. I challenge these same fans to also take on the positive, can-do attitude Jim had when watching this new stuff. We certainly don't have to like everything. I don't like everything the Muppets have done nor do I like everything Jim did with them. He wasn't perfect. The Muppets are best when they're experimental and that requires falling flat sometimes. What I hope is that some of the naysayers will stop complaining so much and take a leap of faith. Duke Remington, MuppetsRule, The Count and 2 others like this. Are these actual people who watched Muppet projects in the past or prudish parents that bought The Muppet Movie on DVD for their 3 year old because it features all their favorite Sesame Street friends? It's kinda like a huge realization I had a while back. You look at the CGI movie version of Horton Hears a Who and it's all at the moment pop culture references, and everything that you'd expect from an early 00's Dreamworks film (essentially being as unoriginal as possible). Then you look at the Horton Hatches the Egg Warner Bros cartoon... guess what it has? At the moment pop culture references! Ruhlly it does. And the bonus of at the moment suicide humor. Wouldn't doubt that some of those prudish parent casual fans would be complaining about how juvenile the Muppet Moments things were as well. Some like to be stuck in a nostalgia bubble. And that, by no means include those who actually watch the original stuff on a regular basis and can actually pick things out with a careful eye. Just casuals that watched Follow That Bird like once when they were 6, and think Miss Piggy is in it somehow. Duke Remington, LeanneRivett and jvcarroll like this. Are you telling me a gun-toting Peter Lorre fish wasn't in the original Seuss book? Agree wholeheartedly. Sit back and enjoy folks. Stop with the nitpicking and the "they should have done this" or "I don't like that they did this". They aren't going to please everybody. This is the most exciting time to be a Muppet fan in the last 30 years. or prudish parents that bought The Muppet Movie on DVD for their 3 year old because it features all their favorite Sesame Street friends? I don't care why they buy The Muppet Movie as long as they do, lol. As far as pop culture references and mature humor, it really depends on the execution. There's a fine line. Jim understood this the overwhelming majority of the time. Since then, it's been hit or miss. And in my experience most "casual" fans do know this. Which would never happen today. The oh so useful MPAA would have a heart attack, lol.